SugarMuses™ is currently sold out! Everything about Sugar Muse boxes are amazing. From the monthly theme, to the tiniest detail, every single item is lovingly and carefully picked. They even send a fascinating letter describing the theme and each item and how to use them. Hands down the best box I’ve ever had the pleasure of subscribing to. Thank you ladies! Last months box was better! Okay so, I have been practicing magick for a while. Even owned my own store for about 5 years. So, I was looking through boxes a couple of months ago and found this box. Decided to give it a try. Was really impressed with March's box. I thought it was awesome. Loved it! This months box, not so much! Don't get me wrong, it smelled good and had a couple of nice things in it. However, nothing that made me believe it was worth what I paid for it. Sorry, would like to give more stars but this month was a complete disappointment. Thank you for such a thoughtful and personalized box. I really have been enjoying it as a newbie to the world of magick! This is my new favorite box. It is so well put together, and absolutely beautiful. Everything smells amazing, and I love the little personal touches that Kristi puts into every box. I highly recommend it for witches and for anyone who wishes to get in touch with their own personal magick. 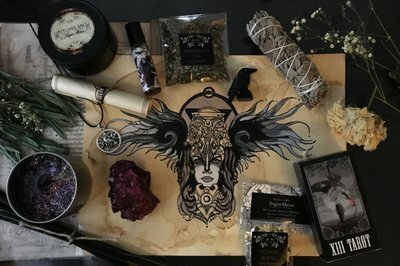 Beautiful selection of items, perfect for my witchy needs. Fast shipping and no broken pieces. LOVE this box! I had originally gotten it as a single box to try since I'd never ordered any subscription boxes before. After I received my first box, I instantly renewed my order. I look forward to my monthly box of happiness!